on band and violin solo; nothing on the Garritan site so see the MacCentral story. Powered by NI Kontakt. Miroslav Orchestral Library from IK Multimedia (Windows/Mac) is an entirely-new orchestral sample library; see our separate article; also US$499. Powered by SampleTank technology. 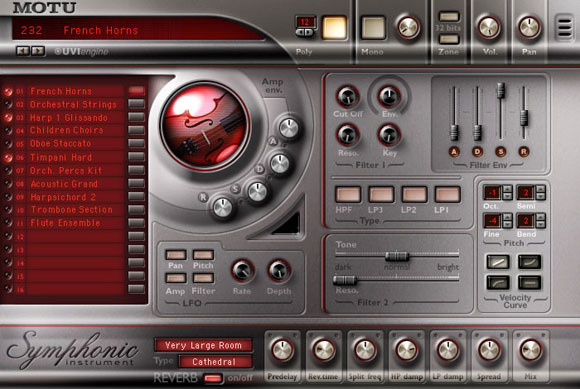 MOTU's Symphonic Instrument (Windows/Mac, every format) is another library, but has some twists that make it worth considering: 8GB for just US$299, built-in convolution reverb, and editable in MOTU's MachFive sampler (none of the others here can be directly edited). Powered by MachFive. Synful (Windows only) was the most unique offering: instead of just being a sample library, it actually intelligently generates phrasing and articulations. Amazingly, a whole orchestra fits in just 32M of RAM. (How . . . I don't know.) US$479.